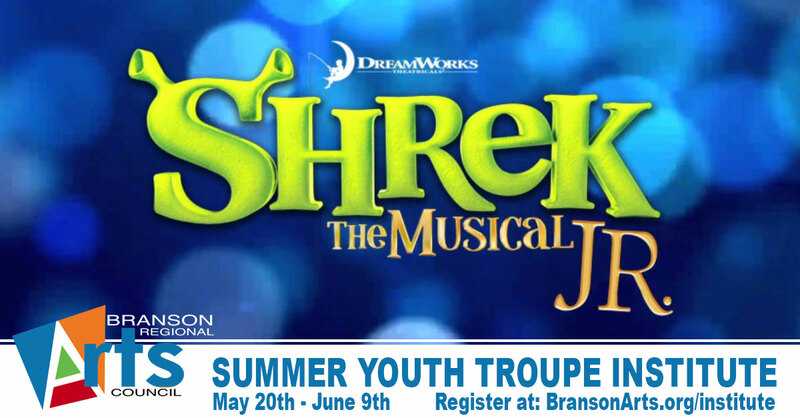 The 2019 Youth Troupe Summer Theatre Institute is now accepting students for it’s production of Shrek the Musical, Jr.
Register your child (ages 6-18) to experience the Branson Regional Arts Council’s exciting summer theatre camp at the Historic Owen Theatre in Branson. The theme is Shrek the Musical Jr., with classes on Monday thru Friday, 8:00am – 12:00pm from May 20 thru June 9th. There will be a initial parent/student meeting on Sunday, May 19th from 6pm-7pm. (No class on May 27th for Memorial Day). No auditions or previous experience required to participate! 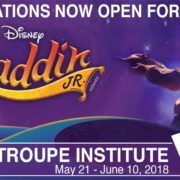 The students will learn acting, dancing, singing, and stage movement culminating in a magnificent stage production of Dreamworks’ Shrek the Musical Jr. with public performances June 6-9, 2019. 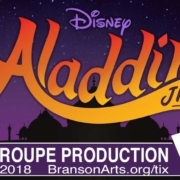 Reserved seat tickets for Shrek the Musical Jr. are on sale now at BransonArts.org/tix. JUMP INTO THE SWAMP!!! Register your child for this MAGICAL award-winning musical theatre experience! Shrek the Musical Jr. is based on the Oscar-winning DreamWorks Animation film and the Broadway production that received a total of twelve Drama Desk Awards and eight Tony Award nominations, including Best Musical! Beauty is in the eye of the ogre! It’s a “big bright beautiful world” as everyone’s favorite ogre, Shrek, leads a cast of fairytale misfits on an adventure to rescue a princess and find true acceptance. Part romance and part twisted fairy tale, Shrek JR. is an irreverently fun show with a powerful message for the whole family.